The Pleasantville football team had one last chance to rally back against Buena Friday with less than 30 seconds left in the fourth quarter. But Byron Spellman ended any hopes the Greyhounds had of a comeback. He intercepted a Hail Mary pass on that drive to give Buena a 19-13 win and earn a share of the West Jersey League United title with Holy Spirit. Luke Santiago, Jaden Roberts and Chris Doughty recorded rushing touchdowns. 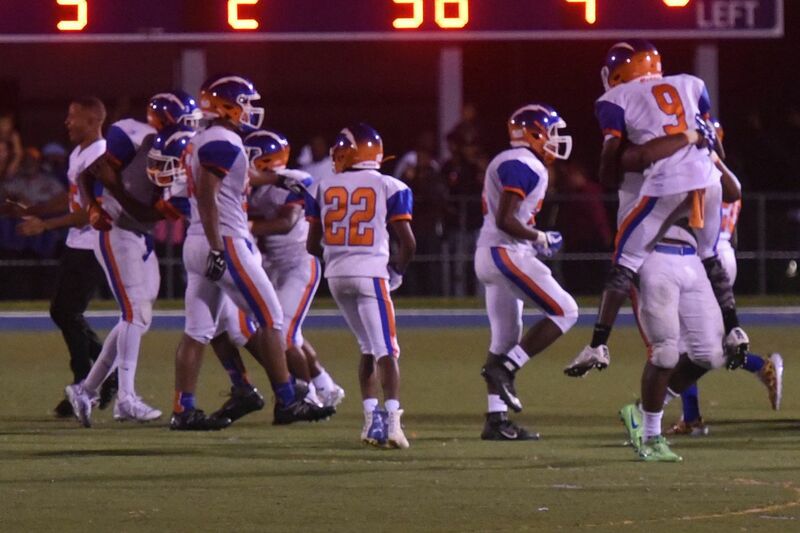 Eddie Jamison tossed three touchdown passes as Millville blanked Atlantic City, 50-0. Solomon DeShields and Dashon Byers each hauled in receiving touchdowns. Tex Thompson had three touchdowns on the ground. Tommy Watson added one rushing touchdown. St. Joseph defeated Timber Creek, 33-14. The Chargers have lost four games straight. Jayden Shertel threw three touchdown passes, including one 47-yard strike to Nate Johnson. Chase Lomax corralled Shertel's second receiving pass and returned an interception for a touchdown. Ahmad Ross and Jade Byers added touchdowns. Karl Giulian and AJ Baez combined for five touchdowns to lead Middle Township past Gloucester, 42-7. West Deptford and Deptford exchanged scores early in the contest, but the Eagles pulled away to win, 28-21. Kenny Lim led the way for West Deptford with two rushing touchdowns, including one 55-yard scamper. Aaron Gravener and TJ Hoyt also scored rushing touchdowns. Hoyt's score was set up by a 62-yard fumble return by Tyshawn Bookman. Eastern extended its winning streak to six games in a 13-12 victory over Hammonton. The Wildcats attempted a 37-yard field goal with 15 seconds left but the kick fell short. TJ Franden and Michael Wall recorded touchdowns. Seneca's ability to create turnovers into points helped the Golden Eagles beat Triton, 28-21. After Geff Giancaterino fumbled late in the fourth quarter, Travis Laster scored his second rushing touchdown on the ensuing drive to give the Mustangs the lead. Malin Jasinski connected with Kaden Hastie for two touchdown passes. Aidan Borguet scored four rushing touchdowns as Delsea defeated Cedar Creek, 38-16. St. Augustine edged Cherokee, 28-10. Chris Allen connected with Nasir Hill and Justin Sharter on receiving touchdowns. Justin Brown and Isaiah Raikes added rushing touchdowns. Alec Rodriguez's overtime interception sealed Oakcrest's 20-14 win over Ocean City. Prior to the turnover, Keevon Berry's scored the eventual game-winning rushing touchdown on the first possession of overtime. Jalen Turney and Marques Miller added touchdowns for the Falcons. Andrew Paolini threw four touchdown passes as Holy Cross rolled past Palmyra, 56-20. Robby Ramirez and Jack Fusco each had two receiving touchdowns. Big scores from Amir Stevenson and Joe Woods helped Northern Burlington beat Delran, 28-7. Woods beat a Delran cornerback and evaded a tackle for a 50-yard touchdown pass from Michael Caloiaro. Stevenson made multiple defenders miss on his way to a 91-yard rushing touchdown. He also had a 48-yard rushing score. Tommy Hill recorded one touchdown on the ground.